Eleven years ago today I drove my 350Z home. It has been an interesting experience. Here are some recent pictures. Your car still looks great! Looks like you've taken really good care of it! 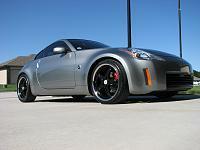 Always nice to see somebody that truely appreciates the Z, and puts in the effort to keep it looking/running well. Nice to have you in the community, sir. And damn, I need to get a garage like that. Looks good. 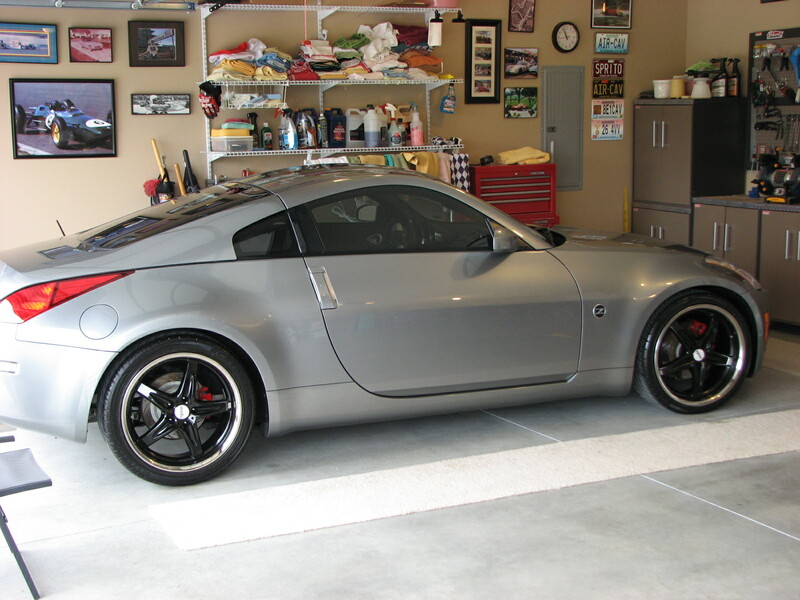 You're one of the few old school members that has kept your Z. Z look great, and anyone with a picture of Jim Clark on the wall can't be all bad, either. CongratZ KC. I just past my 9th anniversary! Pride in ownership is very evident. Usually older members would of gotten a Corvette. Glad to see your fairlady looking as pretty as the day you got her. You gotta do something special for the anniversary. Looks like it just rolled off the showroom floor. Definitely pride of ownership. 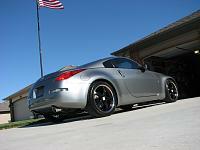 Always good to see more 1 owner z still hanging around this forum. So exciting to see that she still looks that good 11 years down the track. Absolute tribute to the Z and to you keeping her that way. I remember when you posted last year at 10 years. Had mine 10 years and 3 months now, second shipment into the country. May marked 10 years since I purchased my z, she still looks and drives as great as she did when she left the dealership. I've had that picture of Jim Clark for probably 30 years and no one has ever recognized it before. There is also a picture of Masten Gregory there as well. To my knowledge, he is the only person from the state of Missouri to race in a Formula 1 race. And Gregory won the Le Mans 24 Hours in 1965. Jim Clark was my first racing hero. I remember reading Rob Walker's F1 reports in Road & Track, and there were always great pics by Jesse Alexander included. I've got several of his prints, including one of Clark airborne in the rain at Spa-Francorchamps in 1966. I didn't know that trivia about Gregory, so thanks for sharing that. Those were the days, and I'd still rather read about an F1 race from that era than watch one from today. Speaking of Jimmy Clark, here is a picture of my Jim Clark driving gloves. They are reproductions that I got from Griot's Garage but I had an real pair purchased from MG Mitten back in the 1960's. They wore out long ago. You mention about reading about the old F1 races----I have virtually every Road and Track magazine from about 1961 and several from the late 50's. I still love going back and reading an occasional R&T. Oh man, I had a set like that, too, from MG Mitten (or maybe it as the Vilem B. Haan catalog - remember that one?). 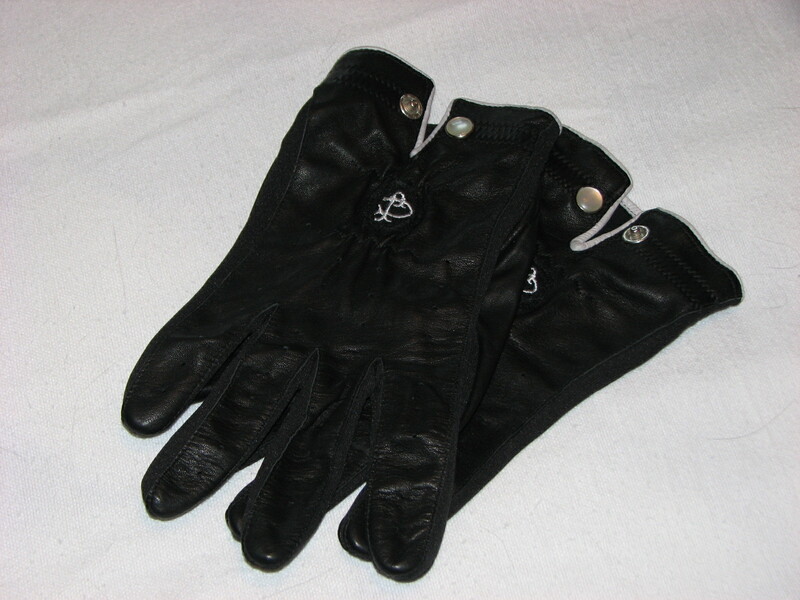 My first car was a '67 XK-E, and the gloves went great with that slippery thin wooden steering wheel. Wish I still had the gloves and the car, but the gloves dried out and the Jaguar was stolen. I also had many stacks of R&T, but my dear mom trashed them all when I moved out for college. Nice to find another old-timer who knew what sports cars really were. I do still own 3 old Alfa Spider's, so I do my part to preserve history. Vilem B. Haan had all kinds of really cool things for sports cars. I bought a new top for my Austin Healey Sprite from them many many years ago.